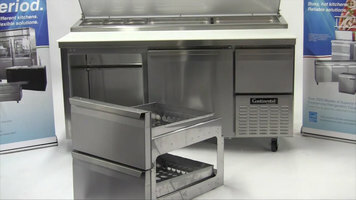 Continental Refrigeration gives you innovative designs for your food service needs. With over 2000 models and growing, Continental Refrigeration is American owned and American operated with superior customer service. Their pizza prep tables range in size from 43” to 118” and are certified under NSF-7 to maintain temperatures at 86 degrees Fahrenheit ambient and designed to maintain NSF-7 temperatures at 100 degrees Fahrenheit ambient. 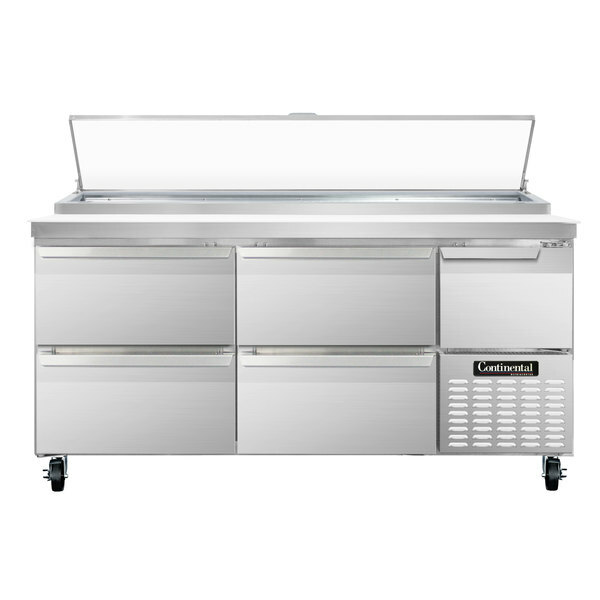 Continental Refrigeration offers a standard pizza prep table with a door over the compressor and a unique air design to utilize fans across the entire back of the unit. The more advanced model comes equipped with additional features like two or three tier drawers, a composite board, and a front-breather. There are also options to have a left-side compressor, a single over shelf, double over shelf, and a drawer section above the compressor that holds (3) 1/3 x 6 pans. You can get either the standard pizza prep table or the prep table with all of the features to fit your prepping needs! 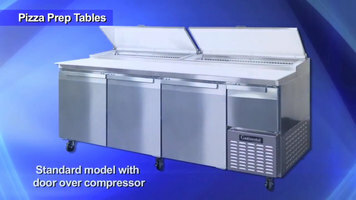 Bring innovation and efficiency to your pizza shop with the Continental Refrigeration pizza prep table! Whether you are looking for the standard table or the upgraded version with options, this pizza prep table is the perfect kitchen addition. Hello, in this segment we’re going to show you how to convert your Continental pizza prep or base unit from doors to drawers. To do this you’re going to need the following: a Philips screwdriver, cordless drill with an eighth inch drill bit or a Philips adapter, a putty knife, 4 #10 sheet metal screws, a caulking gun with food grade silicone, a rubber mallet, some five and quarter inch breaker covers, possibly a hack saw. Also a pliers which is not shown to remove the vertical pilaster strips. Open the door and remove the top and bottom hinge screws and set the door to the side. Take the four hinge screws that you removed and place back into the hinge holes. After that is done, remove the shelf, the clips, and the side vertical pilaster strips. Your drawer assembly will consist of the top and bottom drawer, and the cage that holds the drawers. Open the top and bottom drawer, find the locking clip for the slide, slide forward, push down at the back, and remove the top and bottom drawers. Unfortunately, the cage assembly will not fit into the opening without removing the right and left outer breaker cover. To do this, take a putty knife, slide it under the front edge and gently remove the covers and set to the side. You’ll have to fill in the space above the drawers. You’ll need to cut 2 five and one quarter inch breaker covers from the covers you removed the hacksaw or you can order from the factory. Snap in at the back, slide up into the top corners, and tap in place with a rubber mallet. You are now ready to install the drawer cage. Take the drawer cage, lift it up slightly, and slide it into the opening. After the drawer cage is installed, slide it all the way to the back, making sure that it is flush to the front of the cabinet. Once the cage is installed, locate the four mounting holes; take your cordless drill with the eighth inch drill bit, and drill the four holes and secure with the 4 #10 Philips truss head sheet metal screws. Take your caulking gun with the food grade silicone, if you have any gaps or spaces where air can be infiltrated into the cabinet, seal those areas with the silicone. We’re now ready to install the top and bottom drawers. Pull the slides out, insert the drawer into the slides, and push all the way back until the drawer is set properly. Do the same for the top drawer. Once the drawers are installed, take your locking slide clip, slide back, and lock in place. Check the top and bottom drawer for closing and gasket seal. 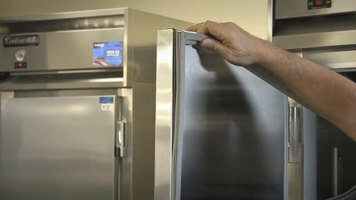 I hope this information was helpful and if you need additional information, please contact the factory or you can download the operation manuals from our website, www.continentalrefrigerator.com. Looking to change the doors on your Continental Refrigerator pizza prep or base unit to drawers? Thanks to this helpful video, you can quickly and easily convert your unit to better suit your foodservice needs. What kinds of pans can I use in my refrigerated prep table? Always refer to your equipment's Specification Sheet and/or Owner's Manual to see what pan sizes and configurations are recommended. Certain accessories may be needed in order to use pans of a different size than what is recommended. It is also important to note that mixing and matching pans from different manufacturers may result in the pans not fitting properly. Prepare your most popular pizzas while keeping your ingredients just inches away with the Continental Refrigerator CPA68-D 68" pizza prep table! This prep table features four drawers and one half door to hold a variety of pizza ingredients in the containers that are most convenient for your business. Its 68" length makes it easy to assemble whole pies right on the 19" wide cutting board, and thanks to the insulated lid, you can be sure your ingredients will stay fresh throughout the day. To maintain foodsafe holding temperatures, this prep table comes with a 1/2 hp compressor that circulates R-134a refrigerant while blowing forced air over the top of your ingredient pans for even chill. The condenser is conveniently located in the bottom right of the table so you can easily service it as needed. The top, front, and end panels of this unit are made of stainless steel for long-lasting durability. The back is completely enclosed and vented, and it is easily removed for maintenance and modification. For excellent temperature retention, the whole unit is insulated with 2" of polyurethane, and thanks to its 5" casters, this prep table moves easily when you need to clean your kitchen. Additional features include a built-in defrost timer, interior hanging thermometer, ergonomically-friendly raised angle rail, and an expansion valve for quick recovery. This unit includes an electronic controller with digital display and hi-low alarm.